Re: Belgium > Jupiler Pro League > 2013/14 Keet in goal according to Soccerway. Thanks for the tip. Re: Belgium > Jupiler Pro League > 2013/14 idd he is. I went huge on Kortrijk and big on Lokeren. Lokeren already 0-2 up so seems nice. Kortrijk having difficulties to get trough the Mons defense, but I'm sure their good physique will get them trough. if not in the 1ste half in the 2nd! Re: Belgium > Jupiler Pro League > 2013/14 Today I'm going for Club Brugge win vs Genk club has the home advantage and havn't played a midweek game. De Sutter is injured, Gudjonson will start and he want's to prove himself. Lestienne is back from suspension and he's great. 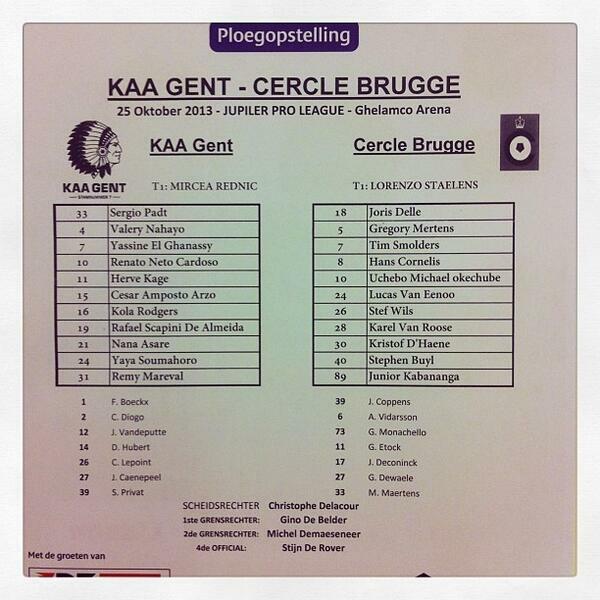 Genk have played a midweek game and it will be physique tough for them. Club Brugge to win, small/medium stakes. Re: Belgium > Jupiler Pro League > 2013/14 2 red cards made it impossible to win this game. Stupid faul from Opare, 2 tackles on the opponents half 2 correct yellow cards, unbelievible for a right defender. Vainqeurs red was just to stupid to tell, never red, tackle on the ball. Unfortunate because there was really a chance to win thisone. I think I'll go for a small on Zulte now but not sure..
Zulte Waregem V Waasland Beveren Both to score = YES @ 1.83 - BET365. On the face of it this looks like an easy three points for Waregem but I think they are slightly too short here as Beveren seem to play pretty open football. Beveren haven't kept a clean sheet away in a year or so and have scored in their last four aways. Zulte Weregem have conceded at least once in four out of their last five home fixtures. Re: Belgium > Jupiler Pro League > 2013/14 This is what happened and what was feared by changing the format of the forum for our Belgian league. In the old days there were weekly +/-10 posts , now there are not even 20 in a half year, pitty. This is what happened and what was feared by changing the format of the forum for our Belgian league. In the old days there were weekly +/-10 posts , now there are not even 20 in a half year, pitty. Re: Belgium > Jupiler Pro League > 2013/14 We got a bit lost on the new forum mate. We were commenting with 3-4 persons in the old format and when it changed the one after the other fell away. For me personally, the last few years I changed my betting a bit also and mostly due to work. I play a lot in "live"betting. And when I write something it's got to be something where I believe 100% in, not something quick and half checked. That's why I hardly post something the last 2 years. Re: Belgium > Jupiler Pro League > 2013/14 Hi from Gibraltar, a few thoughts: Waasland Beveren - Lierse SK Jupiter League Belgium Saturday 21/12 20:00 Prediction: Under 1,5 goals Odds: 3,25 Stake: 2/10 units Bookmaker: Bwin Game review: Two teams in the bottom of the league with enormous problems to score. Waasland Beveren has gone close to 10 hours in the league without scoring a goal, Lierse has scored 7 goals in the last 9 games, and they scored 4 in one game against Cercle Brugge end of November. So we are not really talking about two teams known for the offensive capacity here. Also the importance of the match has to be taken into consideration. Maybe both teams are more careful with the starting point than to risk losing? Further also only 3 goals between these teams the last 3 matches. Re: Belgium > Jupiler Pro League > 2013/14 Zulte Waregem - Oostende Jupiter League Belgium Saturday 21/12 20:00 Prediction: Oostende +1,5 hcp Odds: 1,70 Stake: 3/10 units Bookmaker: Bet365 Game review: Quite interesting game, looking at the table hometeam Waragem should win this quite comfortably. However, we dont think it will be that easy. Waregem currently placed 4th in the league, only losing a single match so far in the league. By far the best hometeam in the division with 10-9-1 (24-9) decent form with 3 wins and 2 draws in the last 5 matches. However, playing an Oostende who started the league very bad, lost 7 out of their first 11 matches. But after that, they improved and are currently one of the strongest teams in terms of form. Winning 4 out of the last 5 matches, and playing quite well. They have improved and is a tricky team to play. We take them on asian +1,5 hcp meaning they can afford to lose with one goal, but we still win the bet. The brave punter here looking for an away win to odds around 8,00. Might be a bigger challenge here for Waregem than most people might think. No doubt they are a good side, but Oostende has improved lately. Re: Belgium > Jupiler Pro League > 2013/14 Kortrijk - Standard Liege I was fairly surprised to see the short odds on Standard for this match. Currently a Standard win is @ 1,7 and I think this is too short.Why? Kortrijk gave every top side of Belgium a game so far. They have beat Club Brugge twice at home once in the league ( 4-1 ) and once in the cup ( 1-0 ). They drew Zulte Waregem recently at home (1-1 ) and they have beat Anderlecht away with 0-1. This team really performs when playing the top sides of Belgium. There are no critical injuries on either side. I have not seen many games in this league so that is a bit of a disclaimer but it just looks wrong to me to favorite Standard so much against a team that gave every top side a game. Standard have been struggling in the past 2 weeks away and got beat away by relegation candidates Cercle Brugge (2-1 )and drew the even worse OH Leuven (1-1 ) I think there is a decent chance for Kortrijk to get a result either a draw or a win. I am playing the 1X Double Chance on Kortrijk @ 2,15 Bet365. The straight win is @ 5,73 Pinnacle but I find that a little too risky. Gl.